When I target a campground for us to visit, I look mostly at the location and reviews. Usually the campgrounds are nice enough but every once in a while we stay in a place that we aren’t likely to ever visit again. And other times we SCORE! 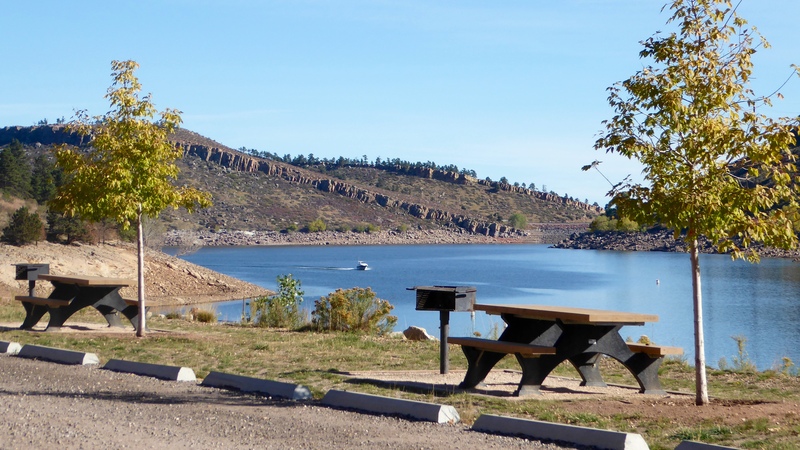 Horsetooth Resevoir County Park is a gem. 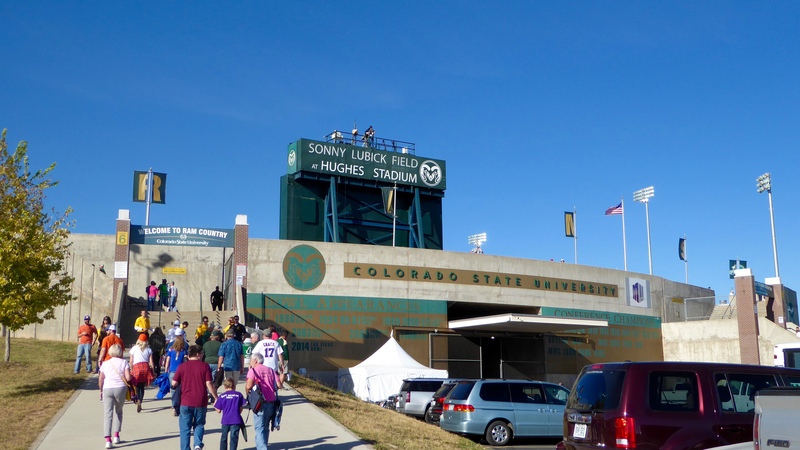 I chose it mostly because it was close to Hughes Stadium for the Boise State – Colorado State football game but it ended up being so much more. We had full hook-ups and were close to the reservoir for an off season rate of $20 per night. It would still be a great place at the full seasonal price of $30 per night. 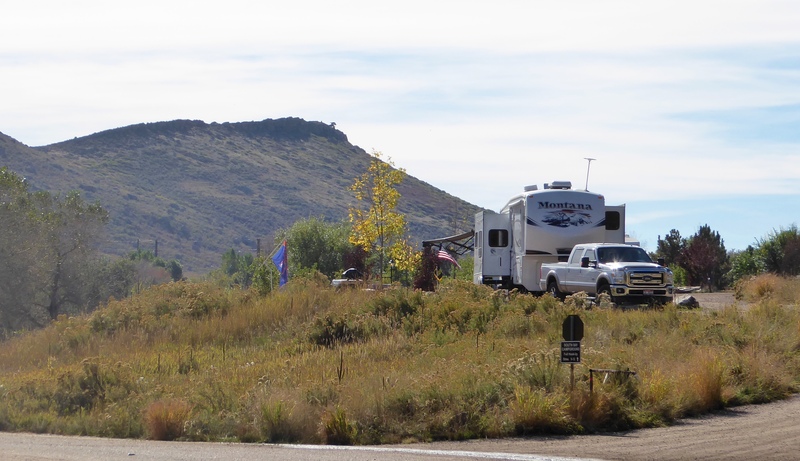 We have experienced some very nice county park campgrounds in Oregon, Arizona and now, Colorado. I’ll be keeping my eyes open for more county parks. 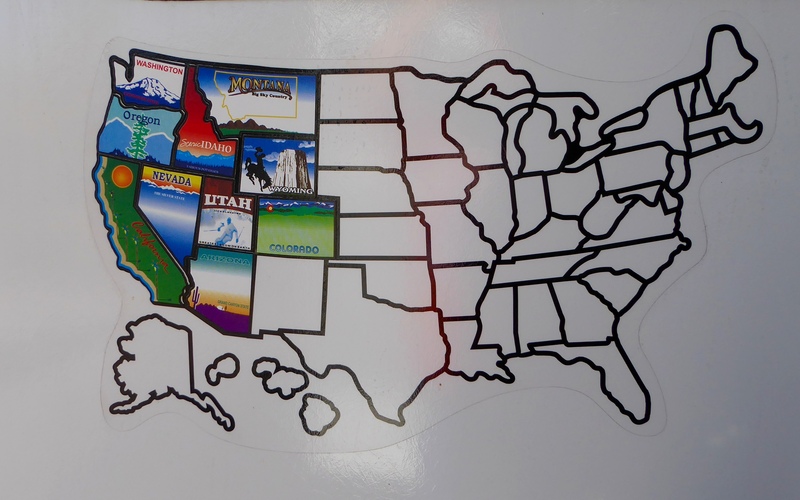 After our first night we added another sticker on our map! At least the west is filled up nicely. 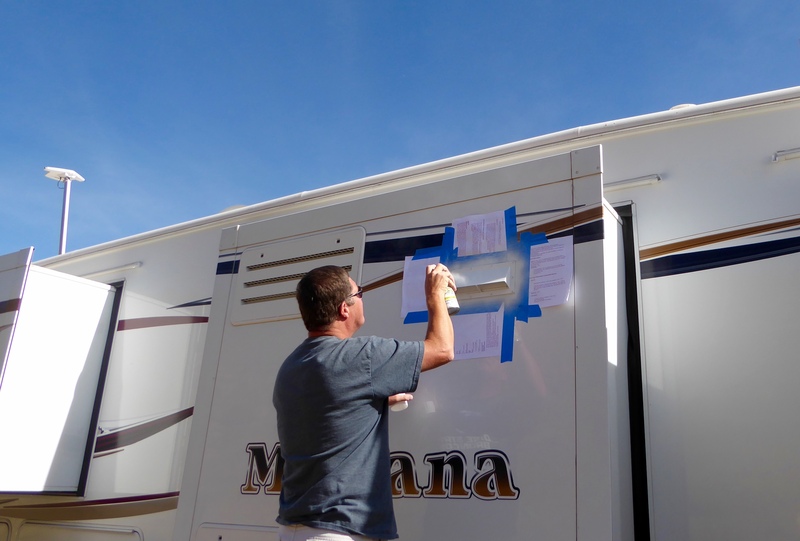 We arrived a couple of days prior to the game so Randy was able to do some minor fix-it stuff. He painted a vent that had yellowed and it looks much better now. I washed windows and Elko supervised. We completed our work and rewarded ourselves with an afternoon matinee of The Martian which we enjoyed a lot. Game day finally arrived and we made the short drive to the stadium and anticipated enjoying the game. Leaving our season tickets behind when we left Boise was hard for me so I was very happy to be able to schedule a couple “away games” on our route. 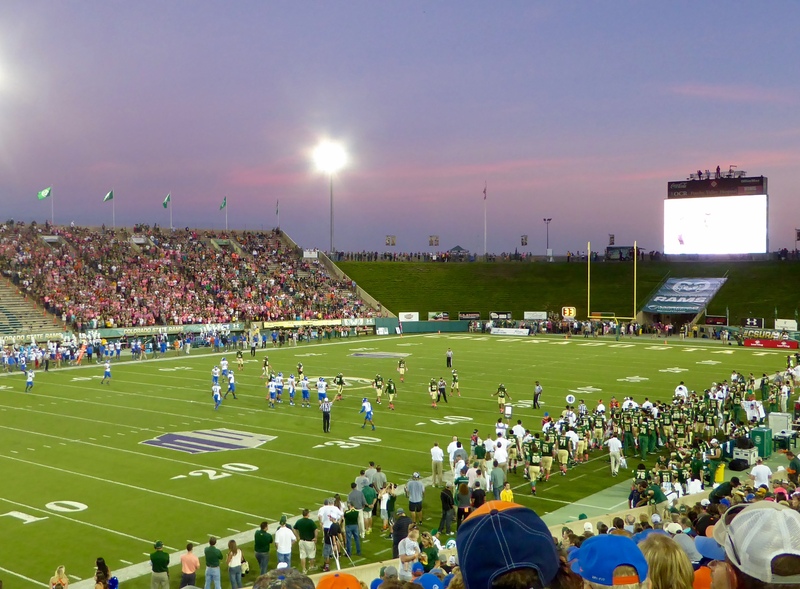 It was a pink game for Colorado State (Breast Cancer Awareness) and I thought it was nice that even the sky cooperated. 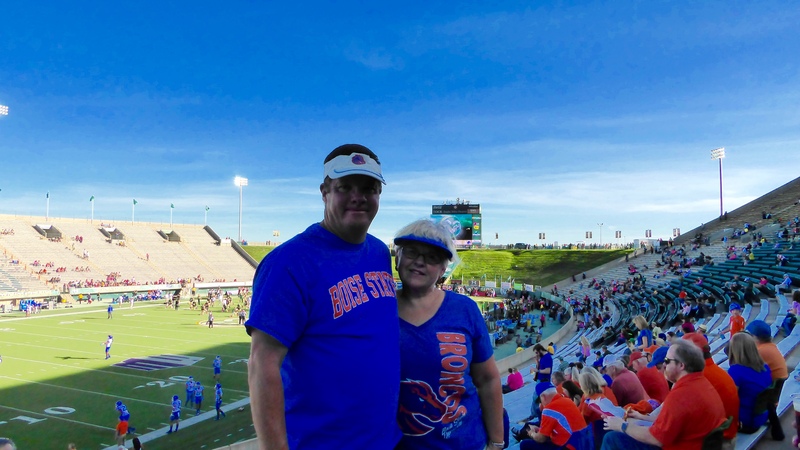 The game was very successful from our perspective with Boise State winning 41-10. I was even able to talk to a couple of people I knew from Boise that had come to Colorado for the game. Fun times! The next day was a driving day through 200 miles of windy Wyoming. We saw warnings of gusts up to 50 miles per hour and advisories against “small trailers” on the roads. Randy didn’t think we would be classified as a small trailer, so we trekked on. Part of the time the wind hit us broadside and partly we headed straight into it. Our regular 12-13 mpg while towing was reduced to about 7 mpg. Unfortunately, we committed an act of littering along the way. Of course, we didn’t mean to lose a rubber tote (and all of its contents) out of the back of our truck in the high winds – but we did. We were not aware of it happening but when we got to a fuel stop – they were gone. The contents lost were our grill accessories, table cloths etc. so not a big deal from any perspective other than littering. We just don’t litter – but we did. So sorry Wyoming! 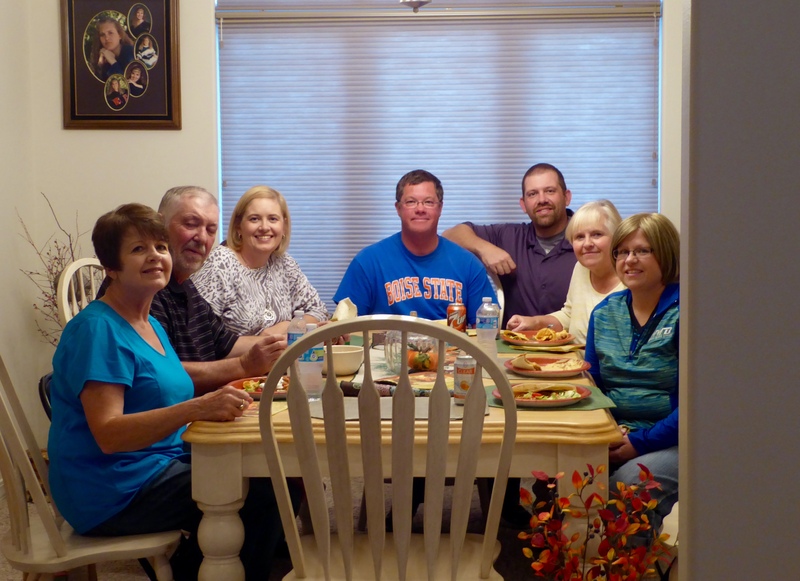 We arrived in Rock Springs to spend some time with family – my cousin Marilyn and her husband, Lynn. 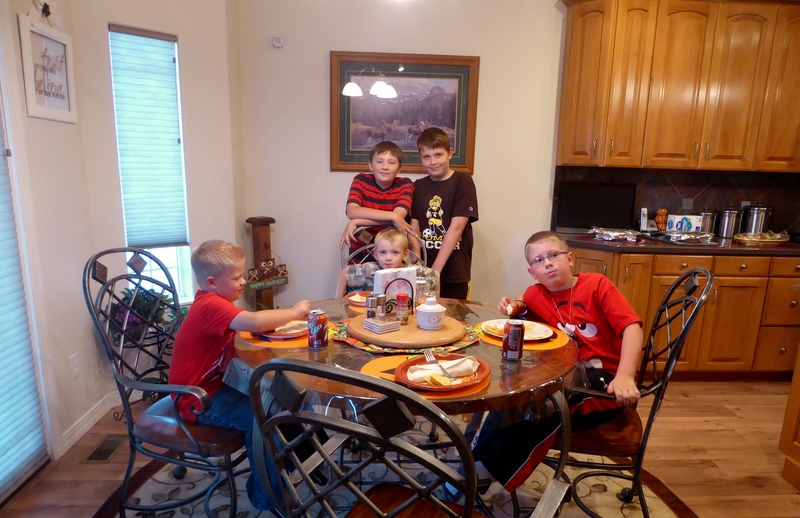 They were gracious enough to gather their clan – son Shawn and daughter in-law Amber, their boys Wesley and Colby, and daughter Tracy with sons Cole, Ian and Toby. Unfortunately, Tracy’s husband was home with a sick son, Shane. We enjoyed our evening with them very much. We spent the next day with Marilyn and Lynn – eating out and touring Rock Springs. 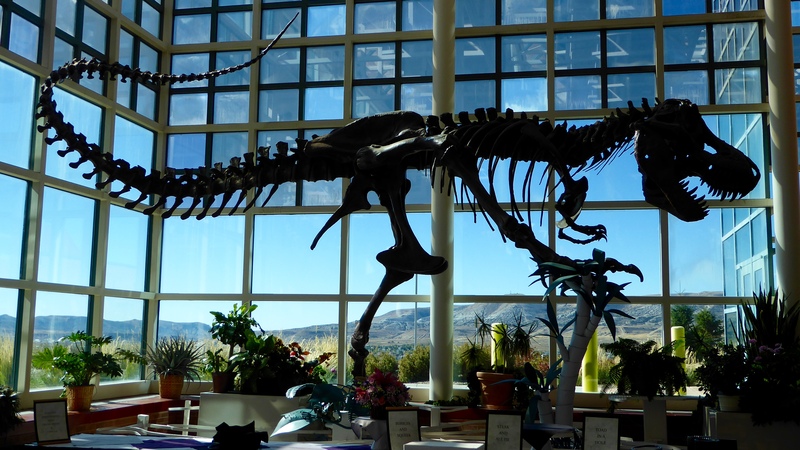 We went to Western Wyoming College to see the dinosaur exhibit – life size replicas of dinosaurs who roamed the area. I was pleased that my past kindergarten dinosaur projects enabled me to name almost all of the dinosaur models! Of course, this one is tyrannosaurus rex – easy! 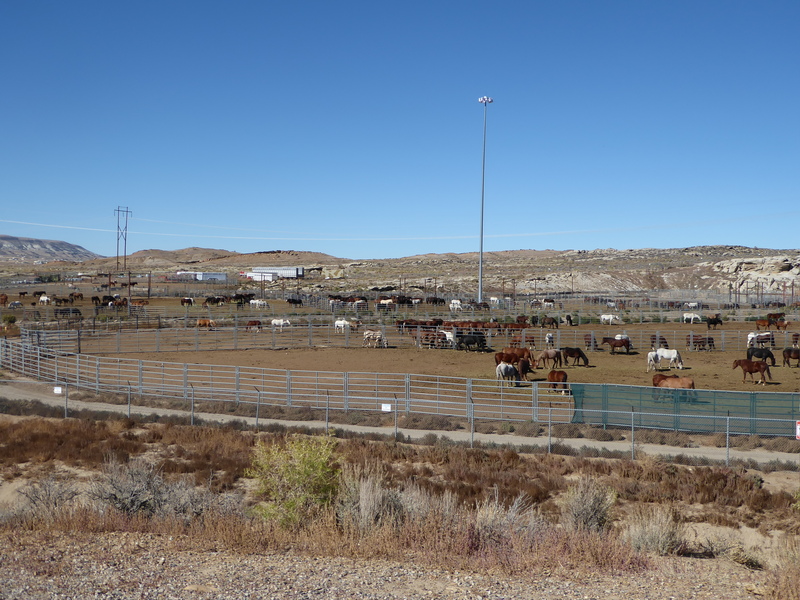 We also went to the Wild Horse corrals. Horses are available for adoption for $185. We had a fun time visiting with our cousins in Rock Springs and thank them for being such gracious hosts. We enjoy that we are able to connect with family and friends around the country as we wander. 2 Responses to Football, Family and Fun! It was so fun to see you both! Loved visiting with you. I will have to watch your travels to come, so fun. Wishing you safe travels on your next adventure! Thanks Tracy. We had a great time in Rock Springs. We’ll be back!